If you're a homeowner living in a cold climate, chances are good you know a thing or two about heating systems. You've probably been maintaining yours for years. But do you know the ins and outs of heating oil? Do you know what common mistakes to avoid in order to save yourself money on fuel? It's not always as simple as it seems. Heating oil is one of the most common fuel sources used to warm residential homes in the United States. According to the U.S. Energy Information Administration, about four billion gallons of heating oil were sold to residential customers in the U.S. during the 2015 season. As you know, it's not cheap. If you've been buying heating oil on an as-needed basis, you are probably aware of the price swings that occur during the winter months and of the high costs that accrue from your monthly bills. There are several things you can do to save money on heating oil costs. For starters, you should take all possible steps to ensure your home is as energy-efficient as possible. We'll talk about many measures you can take yourself, momentarily. But if you wanted to go the extra mile, it would be helpful to have an engineer perform an energy efficiency audit of your home. It can also be helpful to buy heating oil in bulk, during the off-season, in order to take advantage of the seasonal price variability as well as reduced wholesale prices. This can be tricky — and there are a few things you should research before committing to such a large purchase. We’ll discuss these as well. Ready to fill your tank? Check heating oil prices in your area and order online today! Heating oil, also known as No. 2 Fuel Oil, is a refined petroleum product which is distilled from crude oil at a refinery before being sold to residential and industrial customers. Heating is very similar to common diesel fuel, which is used to power internal combustion engines. Often, heating oil and diesel fuel are sourced from the same batch of refined crude oil and for all practical purposes could be used interchangeably. The one major difference between heating oil and diesel fuel is the tax rate. In the United States, Canada and Europe, diesel fuel is more heavily taxed than heating oil. In order to differentiate between the two, heating oil is usually died red, while diesel fuel is not. This makes it possible to enforce the tax laws and prevents people from buying heating oil at a lower price for use as motor fuel. Heating oil contains a mixture of hydrocarbon molecules derived from crude oil and has a low density compared to many oil products. It has a heating value of approximately 137,000 to 141,000 British Thermal Units (BTUs) per gallon and a density of 8.2 lbs. per gallon. Your first and foremost concern if you want to save money on heating oil should be energy efficiency. If your heating system isn't efficiently making use of the BTUs available in the fuel you burn, you'll end up buying a lot more fuel than you should. Factors that affect the efficiencies of home heating systems are multifaceted and include inefficiencies in the furnace and heat distribution system itself, in the control system (thermostat) and in the barriers between the house and the outside environment. 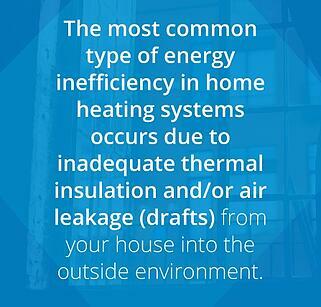 The most common type of energy inefficiency in home heating systems occurs due to inadequate thermal insulation and/or air leakage (drafts) from your house into the outside environment. Heat is molecular vibrational energy that tends to diffuse as much as possible. When you warm your house, you add thermal energy to the air, which has been obtained by burning heating oil. The natural tendency of this molecular vibrational energy will be to diffuse into the cold outside environment. It is up to you, as the homeowner, to take steps to ensure this doesn't happen. Heat will diffuse out of your house into the outside environment as a result of three primary forms of heat transfer: convection, conduction and radiation. Heat transfer out of a house typically occurs predominantly due to convection and conduction and, minimally, through radiation. Convection occurs when warm air physically leaves your house. The natural tendency will be for the warm air inside of your house to mix with the cold air outside due to differences in density. This process is called natural convection. The best way to mitigate heat loss through natural convection is to eliminate all paths through which air can physically leave your house. Mitigating draft problems can be as simple as keeping doors and windows closed. Applying caulk to cracks such as those along window seams is also a good way to prevent warm air from leaving your house. This is known as weather stripping and can significantly reduce the amount of heating oil that must be burned to maintain the set-point temperature of your thermostat. Conduction occurs when heat diffuses through solids, such as your wall or roof, into the outside environment protocols. Different materials conduct heat better or worse than others. Metal, for example, conducts heat very quickly. Thermal insulators, such as fiberglass blankets or mineral bats, conduct heat much more slowly. The best protection against heat loss due to thermal conduction is good insulation. If your walls are not properly insulated, you will lose a lot of heat through them. This will result in the need to burn substantially more heating oil to keep the inside temperature of your house at the desired value. Having double-paned windows also makes a huge difference in the efficiency of your heating system. A common mistake when trying to improve energy efficiency is to lower the temperature too drastically during certain times of the day. Weather.com explains some common mistakes made when using thermostats. In particular, you should aim to avoid large temperature swings in your home. It might seem intuitive to lower the thermostat during certain hours to save yourself fuel, but it doesn't exactly work that way. Maintaining a steady-state temperature requires much less fuel than does the warming of a cold house. So if you let your house temperature fall to save fuel, you might burn more fuel warming your house back up than you saved while it was cool. Another common mistake to avoid is overcompensating with the thermostat. Don't try to overcompensate for a shortcoming in your heating system by over-setting the thermostat. If your heating system isn't reaching the desired set-point, the best course of action is to troubleshoot the problem and find a solution to its root cause rather than setting the thermostat to a higher value in order to make up for the fault. If you simply raise the set temperature, you will end up burning way more fuel than necessary to maintain the same temperature. There could be thermal leakage out of your house. There could be a mechanical problem with your furnace. If you can't solve the problem by weather stripping your house, you should probably have a specialist take a look at your furnace. Whatever the case may be, it's much better to identify and correct the problem than cover it up by overcompensating with the value of your set-point. 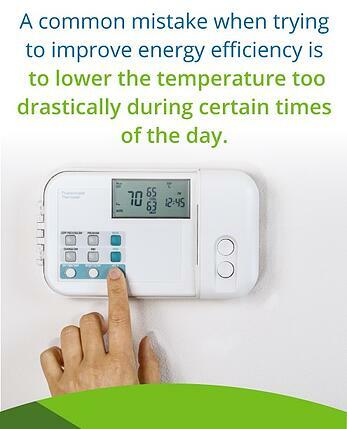 Over-setting the thermostat might be a short-term solution, but it will cause you more problems in the long run. Avoiding these common heating mistakes could, potentially, save you a lot of money. If you're tired of being gouged during the coldest months of the year on heating oil prices, it might be time to start buying heating oil in bulk. Bulk purchase of heating oil offers several long-term advantages and can save you a significant amount of money throughout the course of a year. If you buy a year's worth of fuel during the summer months, you can take advantage of seasonally low prices and ensure you have a steady and reliable supply of fuel for the entire winter season. Purchasing heating oil wholesale requires that you have the capability to store the oil in bulk. You might already have a bulk storage tank or you might need to install one. Care should be taken when using old underground storage tanks to ensure you’re not leaking fuel oil into the local environment. The New York State DEC offers a guide to underground storage tanks that can help you determine the risks of using an old underground storage tank. If you have an old underground tank on your property, it might be wise to install a new tank that poses less of a risk to the environment and, indirectly, to your bank account. You may also consider connecting several smaller tanks in parallel, which might be easier to implement. If your infrastructure is in place and you’re ready to buy a year's worth of heating oil, you should prepare for your purchase carefully before laying down the money. It's a big investment and should be carefully planned as such. Buying heating oil can be a tricky business. In general, the oil market is extremely volatile and can be difficult to predict. However, heating oil prices do follow some clearly defined trends that fluctuate seasonally. Prices tend to be higher in the winter season and are generally highest between the months of October and March. Heating oil prices are also greatly affected by the global oil market, which is driven by geopolitical factors and international rates of supply and demand. The price of crude oil has a direct and substantial impact on the price of heating oil. When crude oil prices are stable, heating oil prices tend to be dictated more by seasonal variability. However, when crude oil prices fluctuate, the resultant price swings can outweigh normal seasonal variability. If you plan on purchasing heating oil in bulk, make sure you take a look at market trends. See how the cost of crude oil compares to past values and use this information to decide whether it makes sense to buy in bulk or wait for the prices to drop. It usually makes the most sense to bulk purchase heating oil during the off-season — that is, in the summertime. This is the closest you will find to a guarantee that prices will be lower. Energy Business Trends Quarterly offers a good analysis of heating oil prices throughout the year. If you're going to purchase in bulk, be sure to buy your heating oil from a company that you trust. Don't take a chance on a new company when you're filling your entire bulk storage tank. If you're going to try someone new, make a small purchase first. This may sound obvious, but you want to make sure they’re not a fly-by-night type of company. Many people have gotten burned on quality, quantity and service by choosing a less than reputable supply company. If you are looking for local pricing, use Smart Touch Energy. We partner with reputable dealers to make sure you get the best service and value. Check local pricing now! Seasonal price gouging: The price of heating oil fluctuates with supply and demand. As you’d expect, the demand for heating oil tends to be highest during the coldest months of the year. This means heating oil is most expensive when it’s most needed. You can avoid paying these high-demand surcharges by purchasing your entire season's worth of oil in bulk before the winter season begins. Expensive automatic delivery systems: Some companies offer automatic delivery options that may appear very convenient. However, it is worth exploring whether the added benefits of these options are really worth the added costs. Sometimes the prices can be significantly higher. At Smart Touch Energy, we actually charge customers a lower rate on every gallon of oil as a thank you for your loyalty. It is the best automatic system on the market — learn more here. Purchasing from unreliable companies: Some companies are simply not reliable. They may offer low-quality oil, they may not deliver the promised quantity or they may not communicate with you when delivering their product. It is important to make sure the company you choose has a proven track record. Not everyone out there has your best interests in mind. At Smart Touch Energy, each member of our local oil dealer network is fully evaluated and reviewed for performance and quality to ensure your experience is easy, trustworthy and most of all, smart. Using an old underground storage tank: Underground storage tanks do not always age well. If you're looking to take an old underground storage tank out of retirement, make sure you have it thoroughly inspected before returning it to service. An oil spill into the ground could cost you way more money than you were expecting. Not following the global market: The overall trends in heating oil prices closely follow the global trends in crude oil prices. Before committing to a bulk heating oil purchase, research the price of crude oil. If it’s unusually high, it might be wise to wait before making your purchase. You can also calculate how much oil you might use this winter by using our online guide. By avoiding the common heating oil mistakes noted above and by ensuring that your home is as energy-efficient as possible, you can save yourself a substantial amount of money on heating oil costs. Your first step is to make the smart choice and partner with Smart Touch Energy.